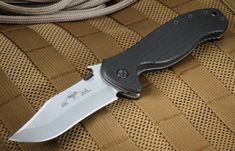 The Emerson American Patriot tactical knife is a testament to the legacy of George Washington and the tactical moves he made with his troop, setting the stage for the nascent United States. Measuring at 9.15 inches overall, it's a beautifully constructed knife built to withstand and memorialize history. The handle, measuring at 5.25 inches, is constructed with a titanium liner lock system, and made with black G-10 epoxy/glass laminate. The G-10 provides a natural, tight grip for the user, so it would not slip out of grasp even in wet conditions. In addition, it includes a tip-up carry clip and a lanyard hole. The powerful blade is made from 154CM stainless steel, measuring at 3.9 inches in length and a thickness of .125 inches. 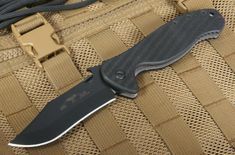 It has a Rockwell Hardness of 57-59 and a conventional V-grind with a single-side edge, making it a great every day tactical knife. The single-sided edge makes it easier to sharpen and use, especially if the knife is used for heavy duty jobs. The blade can come in a stonewashed finish or black Teflon coating, both which helps reduce glare and hides wear. The blade can come either plain or with partial serrations. It opens with the patented, Emerson wave opener, allowing the user to quickly deploy the blade while drawing it out of his or her pocket. You can also find the Emerson Patriot "Special Edition" model, which comes with a hand-crafted, beautifully made oak handle. The wood for the handle is sourced from a two hundred and fifty year old tree directly from George Washington's farm, Mount Vernon. Plus, the knife comes with a copy of a survey map of his farm that was drawn by George Washington himself. This special edition knife comes with a letter of authenticity as well.